In 1981, Mike Purvis and John Ross at Western Technologies/Smith Engineering, were trying to come up with a way to use the lot of cheap cathode ray tube (CRT) screen that WT/SE had picked up recently from a liquidator/surpluss store. They came up with the idea for a small all in one home gaming system using Vector graphics. Smith Engineering/Western Technologies was a videogame company started by Jay Smith, an engineer who was previously an employee at Mattel. Jay, head of Engineering at Western Tec´, gave the go ahead and headed the project, which became known as the Mini Arcade aka HP-3000 and Vector-X. By Spring, 1981, the toy company Kenner had optioned the "Mini Arcade", and it was planned to have only a 5" black and white tube. However by July, it had decided not to. By September of 1981 a company by the name of General Consumer Electronics (GCE) had decided to lease the Mini Arcade after GCE's president, Greg Krakauer saw the concept and early workings and decided it was a potential goldmine. A few modifications were made - for example screen was increased to 9" and the name changed to "Vectrex". By Fall of 1981, the work began on the actuall Vectrex prototype with the goal being the hardware and 12 games completed by June of 1982. John Ross designed the hardware, Gerry Karr and John Hall started the system rom (codenamed the "Executive"). The look and feel of the Vectrex goes to Walter Nakano and Colin Vowles. Both model builders, they created the unique look of the Vectrex system a full 2 years before the Macintosh computer came out with a similar look. By January of 1982 a few more changes occured. The Vectrex was originally supposed to have a 6502 processor, but it was decided this was to slow. So they changed it to a 6809. Also, John Hall left to work on one of the 12 games to be done (later Called Mine Storm). So, Gerry Karr continued on alone and eventually started over from scratch, renaming the system rom to RUM for Run Time Monitor. He eventually brought in other people to contribute, such as Duncan Muirhead who wrote the RUM's trig routines not long after joining the company that month. The Vectrex was a completely vector graphics based system, hence its name. Vector graphics are the kind of graphics used in such popular games as Asteroids, Battlezone, Space War, and Tempest. Vectors graphics are very sharp and allowed the Vectrex to produce some outstanding visual effects such as scaling and rotation. To produce its special graphics, the Vectrex had its own nine by eleven-inch monochrome monitor (color vectors would have been very difficult and expensive to produce). The Vectrex Arcade System was introduced on 6th of June 1982 at the Summer CES show and became available for purchase at $199 in October that year. The Vectrex wasn't just your average game console, however, and even to this day there has never been a videogame system quite like it. With its built-in vector monitor and detachable control board, the Vectrex captured a sleek look and feel. When the Vectrex shipped in 1982, it included the built-in game Mine Storm (from the Asteroids genre). A recessed handle allowed the unit to be easily picked up and carried, although its heavy weight kept it from being a true "portable" system. 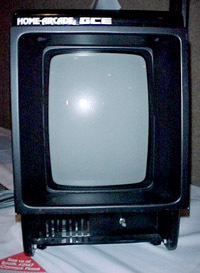 Still, families liked the Vectrex since its built-in screen allowed it to be played without tying up the family TV set. In March of 1983, Milton Bradley (MB) decided they wanted to get into the videogame business and purchased GCE, thus acquiring the Vectrex. Milton Bradley, with it's already established games distribution channels, quickly expanded the Vectrex's distribution overseas. By summer 1983, distribution had begun in Europe and Japan, but by then end of that year the great video game crash had occured and the industry was feeling it's effects. Milton Bradley closed down GCE and decided to distribute the Vectrex itself, discounting it as much as possible (first $150, then $100). This plan lasted until March of that year when they discontinued sales in Europe and slowly phased out the U.S. the rest of that year. They released all rights back to Smith Engineering. The Vectrex came close to coming back from the dead in 1988, when Smith Engineering considered resurrecting the Vectrex as a handheld unit. Milton Bradley thought the $100+ price tag of the unit would make it unsellable, so the idea was scrapped. Nintendo's Game Boy was released the following year and enjoyed huge commercial success, but somehow the handheld Vectrex concept was never revived. Today, Smith Engineering has graciously condoned the not-for-profit distribution of any of the Vectrex's duplicable materials, including games, overlays and manuals. 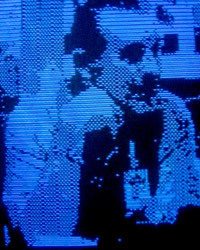 Because of the system's uniqueness, it has inspired a loyal group of Vectrex fanatics who have churned out emulators, web pages, and even new games. Foremost among these Vectrex programmers is John Dondzila, whose first ever contribution to classic console gaming was the 1996 Vectrex game Vector Vaders. In 1999, he produced the first ever 64K Vectrex game, Vecmania, which contains several different games all on one cartridge. Sean Kelly at one point sold a Vectrex multicart - a single cartridge that contains almost the entire library of Vectrex games. Others have produced Vectrex versions of Frogger and Galaxian, among others, making Vectrex possibly the most supported "dead" console, second perhaps only to the Atari 2600. Jay Smith donated the original "Mini Arcade" 1982 handmade prototype and the later Color Vectrex Prototype to the CGE museum in 1999.
was delivered by Bill Hawkins and Tom Sloper, a pair who were instrumental in the development of games for the Vectrex system. Sloper, who started out at Western Technologies (the development company behind the Vectrex) as a modelmaker. Working on the company's "Gametime" watch series, is best known for designing Bedlam and creating the Vectrex's familiar mascot, Spike. Hawkins, a programmer for Western Technologies, was responsible for such Vectrex games as Bedlam, Star Castle, and Cosmic Chasm. Hawkins offered some intriguing background on the birth of Vectrex. The audience learned how Western Technologies moved from handheld electronic games to a revolutionary idea in home console gaming. They learned that the origins of Vectrex as surprisingly humble. "One of the guys who was a hardware designer, John Ross, was going around some surplus places and had come up with a little one-inch CRT that I think was used in a heads-up display for aircraft," said Hawkins. "He found it in a surplus store and brought it in, and he thought it would be a cute thing to make a little handheld game that would use that. Western Technologies, being a development house, rather than just develop something like that they shopped it around. Originally, I think Kenner picked up the idea and said, 'Yeah, we like it, but make it a five-inch CRT.' And then they came up with a thing that looked like a Commodore PET with the CRT sitting up on a little stand and the controls down there [below the CRT]. Kenner subsequently cancelled the development plans, and [Western Technologies] went and shopped it around again. And GCE said, 'We like it, but make it a nine-inch CRT.' And that's how it came about." Later, Hawkins described how the console came to have its now-famous name. "When I started working, it was being called 'Mini Arcade,'" he said. However, another company released a toy called Mini Arcade, so a new name for the console was needed. At one point the machine was to be called "Vectron," and Hawkins even designed a startup screen that displayed this name. Of course the console was never released with that name, and Sloper told the story of how the name "Vectrex" came to be. By this time, the unnamed console had been licensed to General Consumer Electronics (GCE). "So then we had one of those corporate brainstorming sessions with the president of GCE," said Sloper. "We're all talking about what to call this thing. I'm a big fan of 'B' science-fiction movies and I kept coming up with things... I said, 'It's a vector-based machine. Let's call it something with "Vector" in it, like "Vector-X," or something.'" Nobody at the meeting cared for that name, but Sloper pressed on. "I said, 'Well, you can always like, y'know, squeeze things together: "Vectrex," or this or that.' We made a list, we put it on the whiteboard, and eventually they kind of winnowed down the list and decided to call it 'Vectrex.'" It didn't take long for the subject of the discussion to turn to games, and Hawkins started out by describing the development system he used to create them. "The first game I did was Rip-Off," he explained, "and at that point, there really was no standard computer [for development]. What we had for a computer were S100-based CPM systems, and there were no hard disks. You used 8-inch floppies... you had two floppies, and one floppy was the operating system, the other floppy was your data disk. It took me a lttle over three months and 12 boxes of disks to do Rip-Off. The second game I did was Cosmic Chasm, and since all the other programmers were out of town, I stole two of the drives off somebody else's computer and had four disks on [my system], and so I could pull stuff back and forth a lot easier... Cosmic Chasm was done in six weeks on one disk." Prompted by further questions from the audience, Hawkins described the early days of Vectrex development, before the console's hardware had even been fully designed. At that time, programmers had to rely on oscilloscopes driven by prototype boards to simulate the vector graphics-producing capabilities of the finished Vectrex console. Using an emulator developed by Vectrex engineer Gerry Karr to simulate the Vectrex's 6809 processor, programmers were able to run assembled program code on the oscilloscopes to get a picture of what their software would look like on an actual Vectrex screen. Hawkins stated that this system was in use for only two months or so, until development hardware that was closer to a finished Vectrex console became available. The early development system was for the most part reliable, however. Hawkins said that the only real problems sometimes showed up in the aspect ratio of the screen, since the oscilloscopes were square and the actual Vectrex monitor is more rectangular. Immediately after Hawkins had shared this piece of Vectrex history, an audience member asked if he still owned any of the original emulator systems. It turns out that he does. "When the whole company shut down," Hawkins said, "I had taken the system back to Georgia, and I was working out of my house there. They said, 'Can you send all your equipment back, 'cause we're trying to sell stuff out and close the company down.' I said, 'Well, wlll you sell it to me?' And they said, 'Sure! What would you like to pay for it?' And ultimately I picked what I thought was a fair price - probably way high - and they let me keep my equipment." Later, an audience member asked if Hawkins ever uses his old development system any more. He answered, "I have had it on within the last five years, but mostly it sits under a bench." However, he does have backups. "I copied everything over to a PC several years ago, so I have that," he said. "That's my only 6809 emulator, though, so if I were to do any game work again..."
"Feel free!" exclaimed the questioner from the audience. The MB Microvision was designed by Jay Smith as he worked for Mattel in the early 1970s. It was the worlds first handheld LCD games console, in otherwords, the game could be changed by plugging in a new cartridge, sound familiar? You probably thought Nintendo's B&W Gameboy was the first didn't you? Actually you didn't change a cartridge as such with this game, you replaced the entire front of the case, in much the same way as a mobile phone fascia. The new front would have simple graphics printed onto the clear screen covering the LCD display, in this case for the Pinball game. The display itself, was very advanced, especially for the 70's, and was a low resolution dot matrix LCD display, which meant that different graphics could be made using a number of small blocks or pixels, just like the Gameboy years later. Also notable was the analogue control dial at the bottom, which like the Pong TV games, allowed more precise movement. If you find your name mentioned on this page, please contact us!